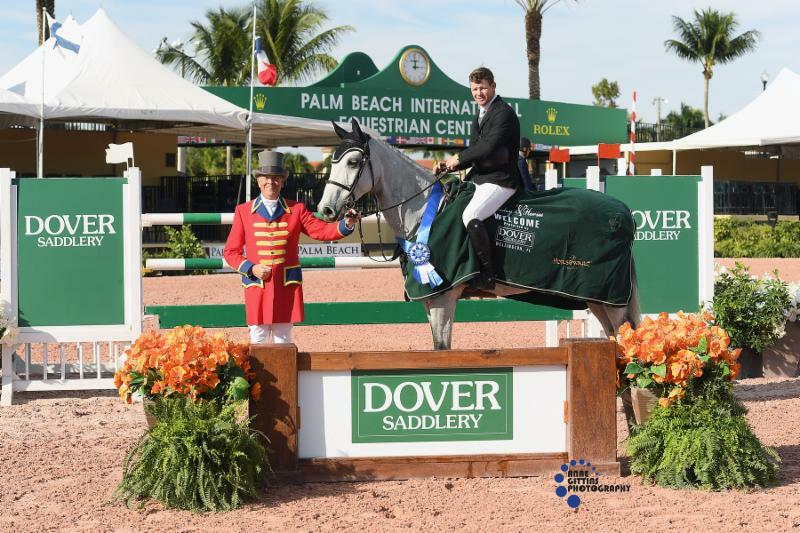 Wellington, FL – November 28, 2018 – Shane Sweetnam (IRL) and Palina De L’Escaut produced a double clear in the $35,000 Dover Saddlery Holiday & Horses Opener CSI 4* to begin 2018 Holiday & Horses competition at Palm Beach International Equestrian Center (PBIEC), conquering their first FEI-level class together with ease and stopping the second-round timers in 30.499 seconds. Samuel Parot (CHI) rode his own Thriller P, a 2004 Swedish Warmblood stallion (Cardento x Lucky Light), to second and double clear in 30.59 seconds, while Daniel Bluman (ISR) rounded out the podium in 31.327 seconds on the speed portion aboard Cartouche, a 2007 stallion, owned by himself and Over the Top Stables, LLC. Sweetnam in his presentation ceremony alongside ring master Steven Rector. The $100,000 USEF U25 Show Jumping National Championship is ready to begin at the Holiday & Horses Show in the Palm Beach International Equestrian Center’s International Arena. The championship’s fourth edition will run from November 29 to December 2. Athletes between the ages of 16 and 25 will compete in three competitions with fences up to 1.50 meters in height in hopes of claiming top honors. Twenty-four-year-old Abigail McArdle (Barrington, Ill.) claimed individual bronze with Adamo in 2016 and Chuck Berry 8 in 2017. She started a partnership with Victorio 5, Victorio Equine Group, LLC’s 12-year-old Hanoverian stallion, earlier this year and aims for a top performance in the championship. McArdle and Victorio 5 earned three top-six finishes at the Pennsylvania National Horse Show in October as they continue to develop as a team. Several competitors from this summer’s Adequan®/FEI North American Youth Championships presented by Gotham North (NAYC) are stepping up to this championship to further their education with the challenging competition format. Seventeen-year-old Samantha Cohen, young rider team gold and individual silver medalist, and 18-year-old McKayla Langmeier, young rider individual bronze medalist, bring their NAYC mounts, Carmen and Durosa W, respectively. Cohen (New York, N.Y.) and Langmeier (East Granby, Conn.) were also teammates on the U.S. team in the FEI Jumping Nations Cup™ Youth Final held in Opglabbeek, Belgium, in September. For full results from the $35,000 Dover Saddlery Holiday & Horses Opener, click here. The 2018 edition of Holiday & Horses CSI 4* competition will continue through Sunday, December 2, featuring the $35,000 Joe DiMaggio’s Children’s Hospital 1.50m Qualifier CSI 4* beginning at 11:00 a.m. on Thursday, November 29, ahead of Saturday night’s $205,000 Holiday & Horses Grand Prix CSI 4* presented by Palm Beach County Sports Commission. For more information on PBIEC and the ESP Holiday Series, please visit www.pbiec.com.